Chemical Guys Dublo Dual-Sided Foam Applicators are big, plush, and grabbable detailing pads. 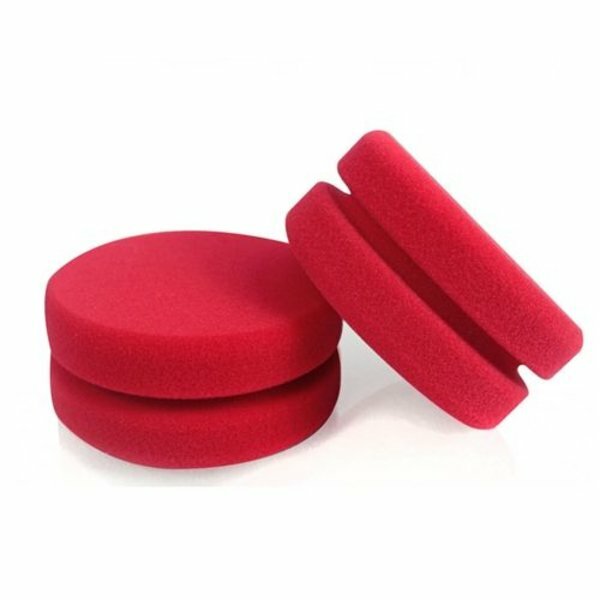 These big foam applicators are perfect for big-handed detailers who have lots of wax or dressing to spread! Extra soft Durafoam is plush, absorbent, and safe for use inside, or outside any vehicle. The unique laser-cut ergonomic design makes it easy to handle and grab, and keeps your fingers and hands clean as you detail. You know what it 's like using cheap applicator pads: after a couple minutes of spreading tire shine dressing, your fingertips turn black from all the embedded grease and grime seeping through the porous foam! It 's not fun, and it can cause cross-contamination between other parts of your car like leather seats and cloth carpets. 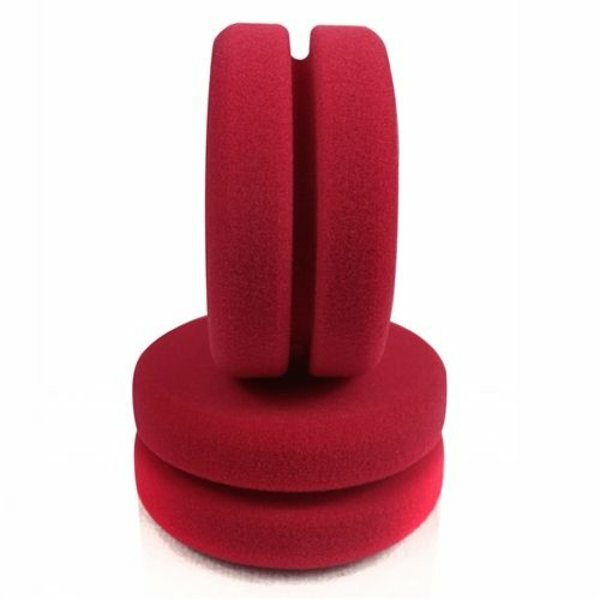 The Dublo Applicator is like two applicator pads in one: the double-sided hockey-puck style design is cut from one extra-large foam disc. The thick center notch leaves a deep groove for fingers to grip without touching any absorbed product, or filth. The dense Durafoam absorbs the perfect amount of your favorite Chemical Guys wax, sealant, glaze, and tire shine dressing, and helps spread a thin, even coat of your preferred product over the surface. Spread wax over paintwork, sealant over polished metals and glass, wheel coatings over chrome rims and polished metal wheels, tire shine dressing over tires and bumper trim parts, or even leather conditioner creams into seats and upholstery. The uses are endless, so pick up the Dublo Applicator 2 Pack for perfect detailing inside and outside your car. Chemical Guys Dublo Dual-Sided Applicators come in packs of two for double the detailing work. Use one Dublo Applicator to spread the perfect coat of wax or sealant over exterior paintwork, and the other to spread tire shine dressing into tires, trim pieces, bumper panels, and side view mirrors for a factory-fresh look. Keep one for exterior use on paintwork and glass, and one for exterior use on leather seats and vinyl dashboards to avoid cross-contamination between different parts of the car. There 's nothing worse than tire shine grease on tan leather seats, or hazy wax and sealant smudges on windows and glass. 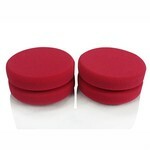 Save yourself the headache, and pick up the Dublo 2 Pack for straightforward detailing inside or outside your vehicle. Swirl marks and scratches are not natural, they are caused by a rough touch when washing, drying, or wiping your car. 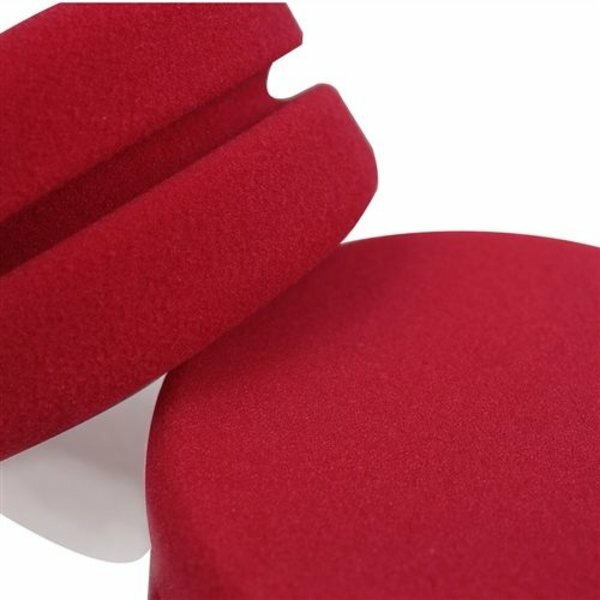 The Dublo Dual-Sided Foam Applicator is made from extra-soft premium Durafoam. This high-density cellular foam is blended to absorb the perfect amount of any Chemical Guys paste wax, cream sealant, glaze, tire shine dressing, or leather conditioner lotion for easy and even spreading over any automobile surface. Use the 2 pack of Dublo Applicators when detailing any part of your car, inside or out. The soft Durafoam offers a scratch-less touch over paintwork, clear coat, carbon fiber, clear plastic headlights and tail lights, wood grain dashboard trim, wheels, clear bra wraps, glossy vinyl wraps, and any other automobile surface that is shiny or clear. Prime the Dublo Applicator Pad with 2 - 4 lines of preferred product.